Around the world, 250 million children are unable to read. Because of a lack of teaching materials, they struggle to recognize even basic words and numbers. In many countries, learning assessments have found that more than 50 percent of students can’t read a single word after several years of school. Without basic literacy, they can’t go on to learn math, science, and other subjects. The result is a lost opportunity for personal and intellectual growth and a massive loss in economic growth and development for their countries. 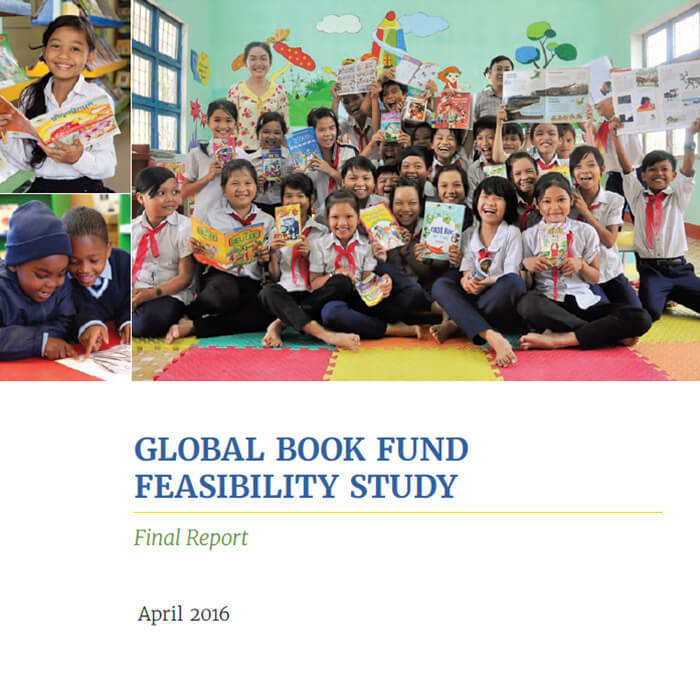 The goal of establishing a Global Book Fund – more broadly, a coordinated set of approaches or interventions – is to transform book development, provision and distribution in order to improve reading outcomes for all children. A Global Book Fund could use innovative financing strategies from the health sector for book development, production, procurement and distribution, thereby lowering costs and increasing quality. Advances in technology and funding mechanisms make it possible to efficiently provide high-quality books in all languages. Between 2015 and 2016, Results for Development (R4D) and International Education Partners (IEP) worked to understand the challenges of low availability and usage of books, and how they can be overcome. Their findings are shared in a Global Book Fund (now called the Global Book Alliance) Feasibility Study which emphasizes the need for a transformative international mechanism to mobilize funding, raise awareness, and improve the provision and use of both textbooks and reading books. Help countries make their book chains more efficient through finance, technical advice, and collaborative learning such that books actually reach students at reasonable cost and are then used by teachers and students. R4D and IEP’s analysis was informed by data collection in 13 countries and global stakeholder consultations, drawing on relevant experiences from funds in health and other sectors as well as lessons from reading programs, commodity procurement, and provision of books. There is a lack of awareness among governments, parents, and teachers of the value of reading books in supporting literacy. To meet a theoretical minimum book standard for all pre-primary and primary students, low and middle income countries need to spend between US$3.1 billion-US$3.9 billion yearly. However, research is needed to understand a more realistic, current, addressable market size. The cost to implement a digital reading program based on a library model is about 12-13 times more expensive than the cost to implement a similar print reading program. However, for structured reading programs where each child is reading the same book at the same time, digital programs are less expensive per child than print programs. Common supply chain challenges include weak demand forecasting, poor management systems, inadequate financing, lack of trained staff, and inefficient distribution. Many teachers are unaware how to appropriately use books in classrooms and how to set up and run school and classroom libraries. For more information on our work and the next phase of the analysis, please contact Shubha Jayaram: sjayaram@r4d.org. Around the world, children don't have the books they need to learn. R4D's analysis informed the creation of a new global effort to get books into the hands of children.